See also Punchline Filled by Tobias Sommer (shasta). Info: Created on 12th April 2010 . Last edited on 13th May 2010. What an awful sample... I'll do a better one soon! Love this one. Heavy duty with enough style to not be boring. @ Shasta: Dear FS master: You have come true with this font an idea where I was working before it and now I give up gladly. I really like your fonts, even I think you and I are thinking about typography in a way very similar. Thank you for your dedication to the strange world of the glyphs. This is great. Lots of fun and interesting details. Congratulations! FontStruct Staff have deemed your FontStruction worthy of special mention. “Punchline” is now a Top Pick. grossartige arbeit! hut ab, shasta! Thanks everyone, really appreciate the feedback, and I'm glad you like it! I must admit it has started to grow on me too as the fontstructing progressed... Probably one of my most useful and usable fonts, and that's mainly thanks to the steeper diagonals made possible with FS 2.0. In that respect the composite brick feature has made a huge step towards more professional designs possible. I don't think I would have made many things much different if i had done this in a free bezier curve software. (Maybe the Y, but that's about it.) Which is pretty cool if you think about it! Unbelievably great! This is just a true font. I'm amazed by the details. I love your diatrics there thick and well design. And gspace and Upixel: Thanks for your comments, glad you like it! Congratulations! FontStruct Staff have deemed your FontStruction worthy of special mention. 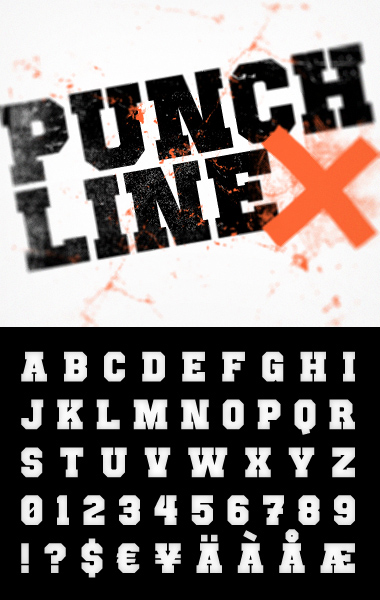 “Punchline” is now a current Featured FontStruction. Awesome, thanks a lot afrojet! Here's a little thank you for all the positive feedback... Though: "little" might not be the appropriate word for this fella. If you didn't tell anyone, no one would ever suspect this is a modular font. Superb craftsmanship. wow great work and marvelous sample ! Félécitations ! Your sample is crazy good (as always)...very nice. What a nice font! I downloaded it! I have a font called wacky. yes if you see it I know I have bad handwriting. Just... wow awesome :) just downloaded it.